Are you heading to the Big Island of Hawaii? I’ve compiled a list to aid fellow gluten intolerant, peanut allergic travelers based on our experiences and the resources that we found. Last summer, we made our second family trip to Hawaii. The problem with Hawaii is that once you have visited this spectacular place, you simply MUST return! Vibrant flowers, black, white and even green sand beaches, waterfalls, a lush rainforest, an active volcano, delicious fruits, Kona coffee, there is so much to enjoy on this diverse island! I’ve been to the Caribbean and it is beautiful but for me, it doesn’t have the same appeal as Hawaii. We’ve taken our family to a variety of destinations since that first trip as we’re not big on returning to the same place twice but eventually we decided to head back. Mind you, it took seven years to make that return. As a couple, we could have trekked there much sooner but we love to travel with our children! They enjoyed snorkeling with sea turtles, sampling exotic fruits, learning Hawaiian words and history and hiking in the breath-taking terrain as much as we did. Having a son with a food allergy and celiac disease means that extra planning is in order to get foods that meet his needs. With two weeks to spend on this island, I did as much research as I could do in advance. Despite this, we learned a lot just by visiting. In the event that you are planning a trip to Hawaii, I’d like to pass along some tips. Personally, I love finding blog entries about my destination to help me prepare so I’m happy to pay it forward. Finding safe food can be challenging! Kailua-Kona is a very popular area to stay on the Big Island with it’s lovely beaches, abundant sunshine, busy harbor, numerous shops and restaurants, Kona coffee farms and so much more. We stayed further south in the Keauhou area as we prefer fewer crowds. In Keauhou, there is a harbor there where you can take a boat excursion south to Kealakekua Bay and the famous Captain Cook monument. The snorkeling at this bay is among the best on the island. It’s truly spectacular! Keauhou has another draw. Manta rays come to feed on the plankton most evenings, created by bright lights in the water. This is one of those bucket-list experiences: To be in the water and watch these enormous, majestic creatures circle and swirl around you is like no other experience! Add this to your must-see list! Our kids loved it ALMOST as much as we did. If you need specialty groceries, a visit to Island Naturals Market and Deli is a must. It’s a well-stocked store with produce, a fabulous deli and many of those staples that you count on at home. If you have researched Hawaii, you know that the cost of groceries is outlandish and health food products are no exception. With the majority of foods imported, costs are high! When checking out, practice deep breathing. Visualize the ocean waves hitting the shore. This is the worst part of a trip to Hawaii and it will soon be over. Costco is great place to stock up on some essentials, particularly if you have a long stay or a big family to feed. The only Costco on the island is in Kailua-Kona. People rave about the gas being cheaper and about the great prices on beach items that you may not have been able to squeeze into your suitcase. There are three main supermarkets: KTA, Sack N Save Kona (a Foodland supermarket) and Safeway. We stayed in Keauhou and shopped at the KTA there and made a few trips back to Kailua-Kona to get to the Safeway and Island Naturals. In the big supermarkets we were able to find a limited amount of gluten-free bread and items that we buy at home such as Amy’s frozen dinners. A word of caution about the KTA: They prepare boiled peanuts in the seafood department, wrap them up and place them on the shelves with the fresh fish. This came as a shock to us. Our condo owners had highly recommended the KTA in Keauhou as they bring in fresh local fish each day. Apparently, this is not the case with all the supermarkets. A lot of the seafood is shipped in. After speaking with the department manager, it was suggested that we call the KTA at 7am when they open and ask them to prepare some fish for us in a freshly cleaned area before they handle the peanuts. We ended up driving in to the Safeway to get our fish instead, due to time restrictions with a booked excursion. Our selections of restaurants were adequate but not ones I’d rave about. Sam Choy’s Kai Lanai in Keahou has a great view but fell short in service and GF selections (think entrees and sides without sauces and marinades that make them so yummy). Bongo Ben’s Island Cafe had a fun atmosphere and was pretty good. They make their own GF bread which took us by surprise. I wasn’t able to get my questions about cross-contamination answered and couldn’t find out if the bread was peanut free with certainty so make a phone call if you plan to visit. We visited the Manago Hotel on our way out of town for convenience. It’s in an interesting old building and appears to be a great place to meet local residents over the age of 65. GF selections were limited to plain fish and vegetables. Annie’s Island Fresh Burgers has gluten-free buns, is very well reviewed and could be a great option for someone with celiac disease. I called but wasn’t satisfied with their response to how they would handle a peanut allergy. There’s an Outback restaurant which is a well-recognized national chain for their practices but who wants to eat at a chain restaurant? And speaking of chains, there’s also a Bubba Gump Shrimp Company which has a limited GF menu and MAY be able to accommodate an allergy. If you don’t have a nut allergy, Lotus Cafe is exclusively GF and can manage a dairy allergy. You may come across Evolution Bakery and Cafe in Kailua-Kona as they make gluten-free goods but beware! Upon calling this establishment, we were told by staff that if you are particularly sensitive to gluten, you may not want to eat there. This business becomes a pizza parlor each evening — and not a GF one! She stated that there’s gluten on the walls and other surfaces… This is not a celiac-friendly business. The Keauhou Farmers’ Market is open every Saturday from 8am – noon in the parking lot of the Keauhou Shopping Center. This visit was truly a highlight of our trip to Hawaii. 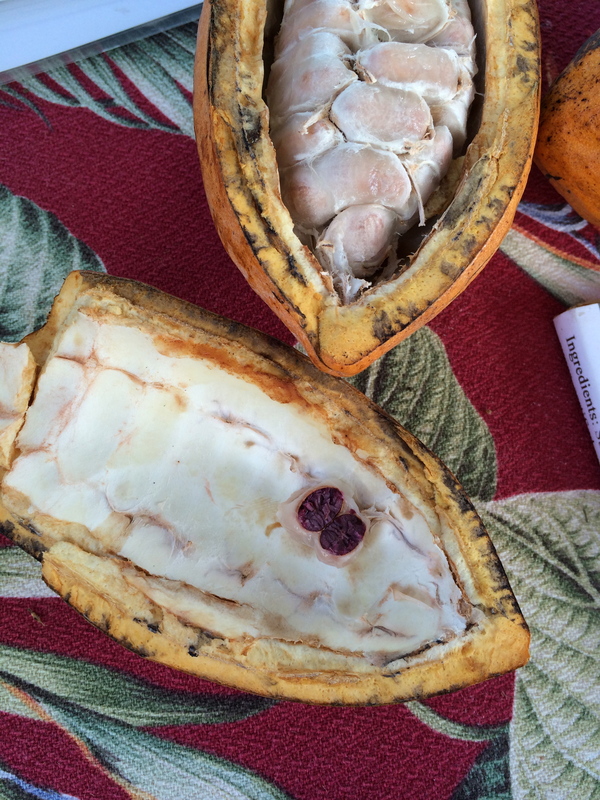 The vendors were friendly and offered samples of locally grown and prepared chocolate, interesting fruits, Macadamia nuts and nut brittle (uncontaminated by peanuts), teas, coffees, salsas and more. My son had tasting experiences that were unparalleled. We bought local grass-fed beef that was less expensive than it is at home in the midwest. The fish was fresh and delicious. Prices were terrific! Read more about why a farmer’s market should be in your itinerary in my post. A visit to Hawaii isn’t complete without a trek to Volcanoes National Park! We planned a visit there in 2007 but happened to visit in a week when no lava could be viewed. Seeing the dramatic landscapes created by lava flows, the beautiful rain forest and experiencing a hike through a lava tube, we still had a wonderful time. Luckily, our return trip of 2014 awarded us with a nighttime view of the orange glow from lava. Whether you see lava or not, you won’t leave disappointed! The town of Volcano is right near the national park. We have stayed in that town twice now and found that the Volcano General Store, which is listed for groceries, is not a grocery store by any means. It’s a convenience store with some interesting items mixed in. If you plan to stay here, bring groceries from Kailua-Kona or Hilo. There aren’t many dining choices in this area. We splurged and ate dinner at the Kilauea Lodge and Restaurant. The staff was knowledgable about handling our special dietary needs and we had a delicious meal! The view is outstanding as well. 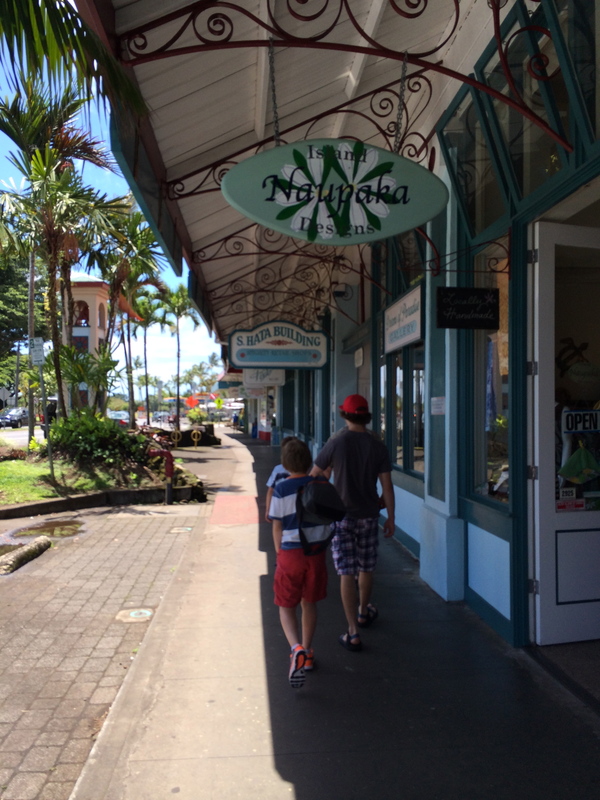 Hilo Bay Storefronts are picturesque! I love Hilo! It has a completely different flavor! When you visit this side of the island, you’ll leave the throngs of tourists behind. The Hilo Bay area is picturesque with its historic wooden-front stores painted in pastels, tall palm trees, large japanese garden nearby and spectacular Banyan trees lining a row of old bay-front hotels. Hilo has had a few devastating tsunamis in the 20th century and there’s an interesting museum devoted to it. There are a few other museums, a beautiful zoo, a macadamia nut factory, botanical gardens and lots more to see in this area. You’ll need your rain jacket handy here but the reward is the spectacular green countryside, gigantic blossoms and waterfalls. There are two health food stores in Hilo: Island Naturals Hilo Market and Deli and Abundant Life Natural Foods. Island Naturals is a fabulous store. We visited their Kailua-Kona location several times. In Hilo, we shopped at Abundant Life Foods though which is located in the shops right on the bay in Hilo, near the farmer’s market. The parking is really difficult but the store is very well stocked and we found everything that we needed. Loved that place! There are three grocery stores which include Safeway, Sack N Save Hilo (a Foodland store) and two KTAs. Our stay was short so we visited one store only briefly. We chose one restaurant and had a terrific meal with a magnificent view. 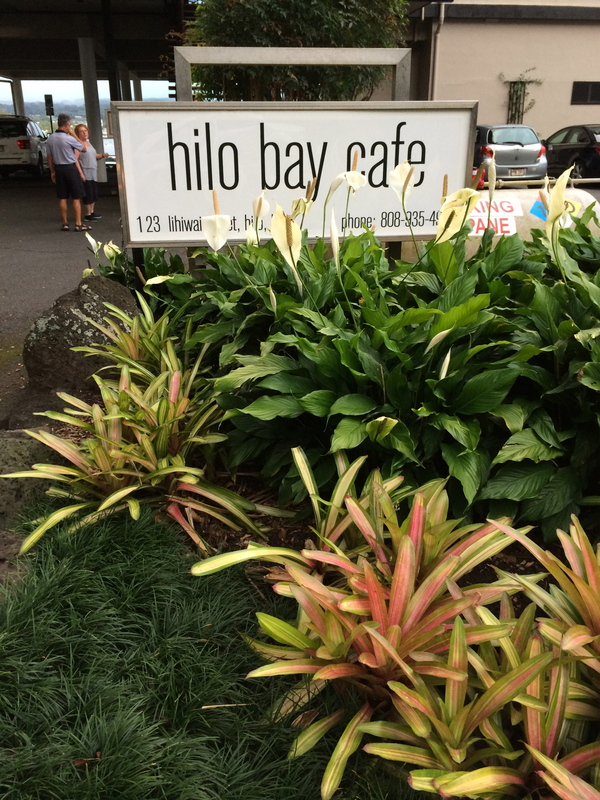 It’s called the Hilo Bay Cafe. My peanut allergic, celiac son was able to dine safely with many choices. The staff was well equipped to handle special dietary needs. The Hilo Farmer’s Market is located along the bay front shopping area. I think we visited during off-hours. While they had loads of produce, there was little else except some cheap touristy things that are imported. Wednesdays and Saturdays are the days to visit this market as they have much more to offer. Next time we return to Hawaii, we plan to check out the Maku’u Farmers’ Market in Pahoa which is 10 miles away. It is well reviewed and offers lots of local artisans, bakers and entertainment. It sounds like an experience! We only passed through this interesting town located on the Big Island’s paniolo (cowboy) country on our counter-clockwise trip around the island. We had hoped to find a lunch place somewhere between Hilo and Waimea but all options came up short. We had a late lunch at The Fish and The Hog. With no crowds whatsoever, the staff was attentive to our needs, allowing us to look at packages and bottles to check ingredients. They provided a simple but safe meal for my son. If we had more time, I think Merriman’s would be the place to dine at. They are well reviewed and, reportedly, have lots of GF choices. Waimea has lots of dining options, a couple of large supermarkets and a farmers’ market. The drive down to the Kohala Coast from Waimea is marked by miles of straw colored ranch lands. You look around and wonder: Is this Hawaii? It looks like Wyoming! When you near the west coast the terrain will, again, make you question your surroundings as you look at a wide expanse of black lava, broken up into boulders. Not a tree or bush in sight, just miles of this unfriendly terrain. It is truly surreal. Lining the coast, however, are some beautifully landscaped resort communities. The beaches and coral reefs are downright stunning! Snorkeling here in this area was one of the highlights of our trip. 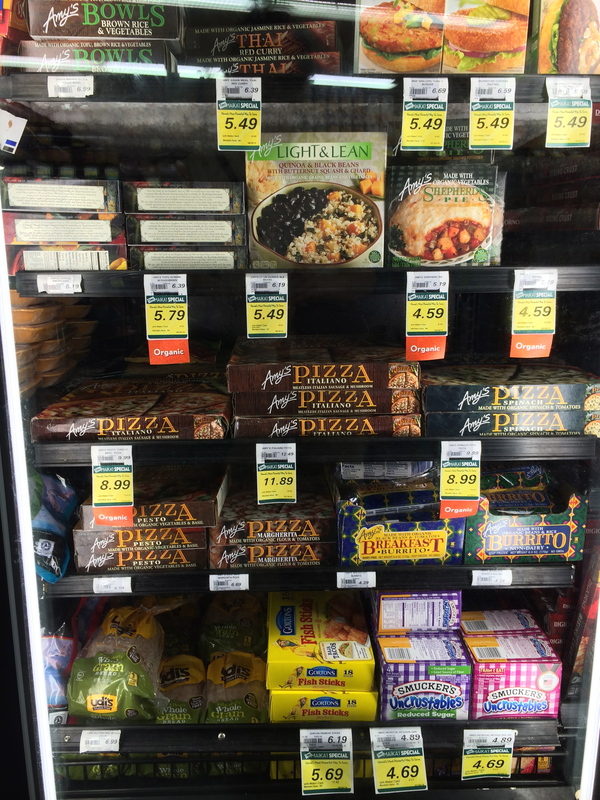 We found some of our specialty food staples in the Foodland at Mauna Lani. Upon arrival, my notes on finding specialty foods in this area led us on a fruitless search. We were unable to find what we needed for our week’s stay at a condo in the Mauna Lani Resort. Finally, we gave up and headed thirty miles south to Kailua-Kona to that wonderful store, Island Naturals Market and Deli. Grocery stores include: Foodland Farms at the Mauna Lani shops, the Island Gourmet Market in the Queen’s Marketplace in the Waikoloa coastal area and the Waikoloa Village Market, which is a ten minute drive up the mountain. We found a small selection of specialty foods in each of these grocery stores. We visited the Mauna Lani Beach Club daily during our stay. This was, hands down, our favorite beach because it was sheltered and provided excellent snorkeling! We dined once at the beachfront restaurant, Napua, was pricey but delicious. The staff understands gluten-free dining and was able to accommodate my son’s peanut allergy as well. 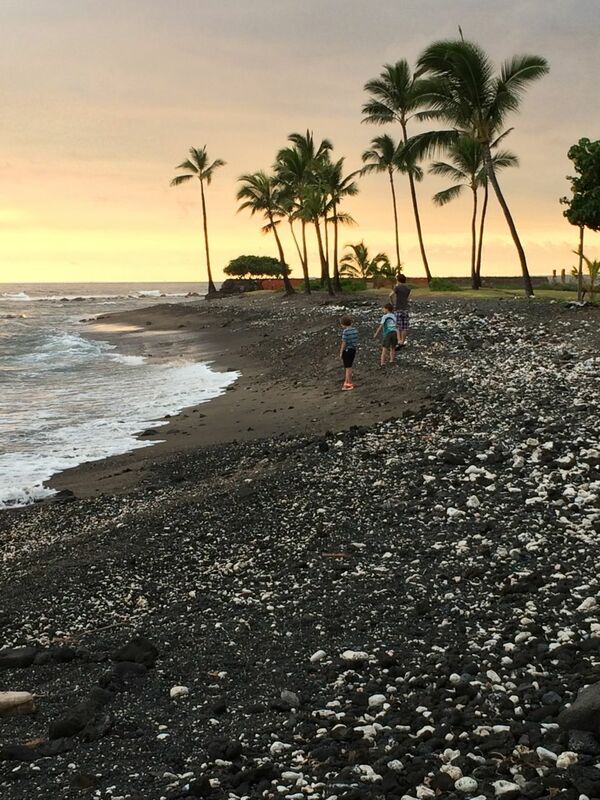 Further north, there is a spectacular beach at the Mauna Kea Hotel so we dined at the beach side restaurant called Hau Tree and spent the afternoon in paradise! Hau Tree has gluten-free options that include Udi’s Bread and the staff was very knowledgable about food allergies. It was an expensive but tasty lunch. We drove around the northern tip of the Big Island in order to visit the spectacular Pololu Valley Lookout. The King’s View Cafe in Kapaau was conveniently located along the way and offered gluten-free pizza. My son enjoyed it! The Mauna Kea Luau was fantastic! You can’t go to Hawaii without experiencing a luau! 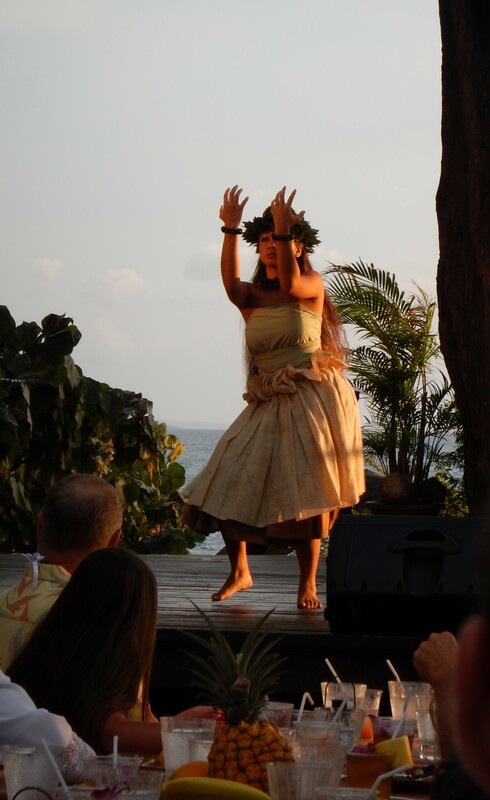 We went to the Mauna Kea Hawaiian Luau which is in a spectacular oceanfront setting. The entertainment was terrific! We spoke with the chef ahead of time and he gave us a tour of all of the foods, letting us know what was safe and what wasn’t. My recommendation is to arrive extra early and arrange to go first to reduce the chances of cross-contamination. Ask for a china plate as the food is served on porous wooden trays. If you’re looking for dining that meets your needs on vacation, check out the tips of my post: Finding Safe Food on Vacation: Seven Lessons Learned. A listing of Big Island farmers’ markets can be found here. Disclaimer: This list is a guide to help you get started in planning your trip with food restrictions. Restaurants and markets change and chefs come and go. Please do your own research before making a decision to dine. This is really promising, I’d love to see Hawaii someday but had worried about the food options for the kiddos! Definitely doable, Homa! Cooking fresh produce from a farmers’ market is the most economical option (and delicious!) but it’s good to have some access to specialty foods and dining establishments that will meet your needs. Polina, from my perspective you’re half way there! 🙂 We use credit cards to get miles and periodically cash in to get flights. There are some affordable places in Hawaii. We stayed for a few nights off the beaten path at a B&B with a fridge, microwave & electric skillet that cost us just under $100 per night — for a family of 5! Granted, we had to take military showers and it was far from beachfront but it was still fun! You are utterly amazing! What a resource. I have never been to Hawaii, but you’ve convinced me to add it to The List! Thanks, Catherine! It’s an amazing place! Choice Mart, South of Kona is a small store yet it had several gluten and allergy friendly items for a peanut and nut allergy. We bought 2 bags of groceries. I was excited to find wowbutter and enjoy products. That is great to know. Thanks for sharing, Cynthia! Thank you for this fantastic posting Karen! It really helped us on our recent trip to the Big Island. I’ll add in another few tid bits to help travellers heading there. If you want to splurge and treat yourselves, visit the Fairmont Orchid in Mauna Lani. They have a separate kitchen including pots, dishes, utensils…you name it! This kitchen is a dedicated space free of the major allergens including nuts and gluten. Contact Dena.Hunter@Fairmont.com prior to arriving…her entire staff was anticipating our arrival and everyone was up to speed; it was impressive. Our daughter enjoyed a safe, gluten free waffle with a clean bowl of whipping cream, syrup and a bowl of beautiful Hawaiian fruit. A dream come true for her! Dena (head of food services) also mentioned that they could accommodate us at any of their restaurants and could provide virtually anything off of the menu safely. My daughter’s eye’s lit up at the thought of having a grilled cheese and french fries by the pool! Unfortunately we weren’t staying there so didn’t have the chance to enjoy that treat. I understand that the Hilton in Waikaloa is also very accommodating and well educated and trained when it comes to providing celiac safe meals. We didn’t visit but it’s worth checking out. Of particular note is the snorkelling trip we enjoyed. We visited Kealakekua Bay (where the Captain Cook monument is) with Fairwinds and they did a tremendous job of feeding our daughter safely. We are rather high maintenance with bringing celiac and our vegetarian ways travelling with us and they happily took on the task. They were completely accommodating and provided Udi’s buns and gf veggie patties that were safely prepared on tin foil on the BBQ and separated (and guarded I might add!) carefully. They happily put aside a few condiments into separate containers before the gluten eating guests had the chance to dip the end of the ketchup squeezer onto their gluten buns. Of course we were prepared with our cooler full of food just in case our well meaning hosts weren’t up to the task of satisfying my watchful eyes but I must say, it was a treat for all of us to enjoy eating the same meal together. Huge kudos to them for safely accommodating guests with different needs. What a great morning. I wonder if they would be equally up to the task with nut allergies as well? If you require that, it’s worth a call. Lastly, Costco (by the airport) is a great resource for gf products (pasta, crackers etc), particularly if you are staying for some time or need to feed an army of people with celiac and so is the Target just south of the airport; definitely less expensive than some of the grocery stores. Your tips were a fantastic resource Karen, thank you! Thank you, Kris! That’s a very helpful review! I’m so glad to know that the Fairmont Orchid and the Fairwinds were both so accommodating. We enjoyed that wonderful snorkel too but did not receive the same level of accommodation. Things are improving for those with special diets! Wow, nice job on this. Very specific thing but I bet it’s helping a lot of people. If you ever want to write something like this for https://lookintohawaii.com (we can link it back to your site here so you get credit) please contact us and let us know. Merriman’s is definitely a great place for those with dietary restrictions. They were very accomodating when I was there! The waiter was able to tell me everything on the menu that could be made gluten-free. I highly recommend if you are on the Big Island! Thank you for your feedback, Brittany! Wow! This is amazing! I’m a 26 years old celiac who’s planning to visit Hawaii with friends soon and I’m really, really concerned about what I’m going to eat. I would like to avoid cooking on my vacations, but I assume that me being celiac is just simply unavoidable! Haha! I usually try to avoid going to restaurants that aren’t exclusively gluten-free or offer a gluten-free menu suitable for celiacs, because I don’t feel confident with asking the staff to accomodate to my needs as I have had bad experiences in the past (ending up in bed for about 4 days with terrible stomach cramps and diarrhea), but I guess I’ll have to give it a try again this time. But what about the issue of cross contamination? Do they understand that? How do you verify they indeed have been very careful when cooking? Thank you a lot for all this information! It was incredibly helpful! great tips, plan on visiting the big island next week! Glad you found it helpful, Pam! Have a wonderful trip! I welcome your tips and feedback. If you have time, please reply after your trip so we can learn from your experience as well!